Custom Printed Color Changing Sunglasses have a total size of 1 1/2"w x 1/4"h and are available in Frosted Clear color. The frosted color frames change color when they are exposed to the sunlight. UV400 lenses are strength of these customizable new arrival sunglasses. They are offering 100% UVA/UVB protection which makes them trendy as well as very helpful to stay in the sun during events and activities. Order these custom designer sunglasses right now to win free artwork design, free online proofs, and fastest turnaround time offers. 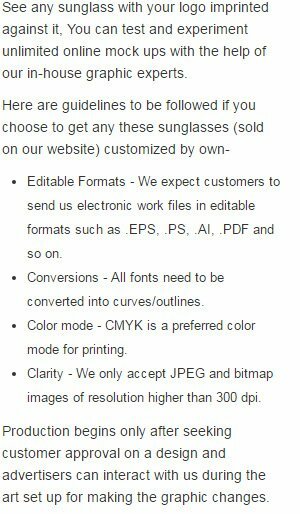 Request a quote to know savings that you can pocket on bulk ordering these Custom Printed Color Changing Sunglasses. When ordering blank items of this product either exactly 1 or atleast '+20+' must be ordered!